Come learn what we do and how we help manufacturers. Celebrate Thanksgiving with SFMade food and beverage manufacturers! Luke’s Local will be opening up their commercial ktichen so you can meet the SFMade foodmakers they share their kitchen with like SoW Juice and Bread SRSLY. If you ‘re interested in producing food/beverage locally, this workshop is for you! If you’re planning on producing apparel or sewn products, this workshop is for you! Hey SFMade members, it’s easy to rep the SFMade brand! Check out our handy guide, which includes an order form for free SFMade stickers, table tents, and other collateral. SFMade members can post a job on SFMade’s Job Board, and we’ll help you screen for qualified candidates too, including for seasonal hires! Email job descriptions to [email protected]. Who: 50 different vendors each day selling jewelry, apparel, bags, chocolate, wine, gourmet gifts, body products, childrens toys, home and garden items, pet gear, holiday cards and decorations, and more! Product We Love: Speaking of the holidays…Whether you’re thinking about Thanksgiving centerpieces or just some holiday foliage to lighten up your garden or home, Urban FarmGirls has got you covered. 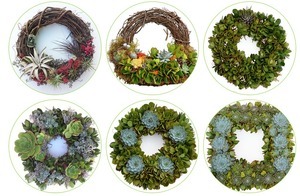 Their handmade pozzola pots make great gifts, but we also love these living wreaths, which you can buy online or at the SFMade Holiday Gift Fair. I want one! Get them here. Think SOMA is just for tech companies? Take a walk towards 8th and Minna, and you may stumble upon David Liu and a group of contractors taking over the sidewalk while piecing together a 40-foot wide metal frame for an LED structure, still hot from welding inside his idea lab and machine fabrication shop, destined for a nationwide concert tour leaving that same night. David started SOMA Precision when he rented an office and bought a small desktop metalworking machine to prototype his own products— things like bicycle parts or landscaping tools. He didn’t do any formal marketing, but word got out that he was good, and the customers kept coming. Now, he’s got a bigger shop and a solid customer base. Known for his quick turnaround, David makes products like the plastic stylus you use to sign off on your UPS or FedEx packages, and metal working tools for some of the biggest manufacturers in the country. He’s also made rocket parts, and architectural pieces for Bay Area restaurants and bars. He’s been building his business for seven years in SOMA, and loves that the neighborhood still has a mix of manufacturers and residential homes. City of San Francisco, Rickshaw Bagworks, Citi, FHL Bank San Francisco, Anchor Brewers and Distillers, Wells Fargo, Levi Strauss & Co, Ritual Coffee Roasters, Cayson Culinary Designs, Hanson Bridgett, New Resource Bank, Pacific Waterfront Partners, Bank of America, McRoskey Mattress Co, TechShop, BayPoint Benefits, DODOCase, North Point Advisors, and Insperity. SFMade’s mission is to build and support a vibrant manufacturing sector in San Francisco, that sustains companies producing locally-made products, encourages entrepreneurship and innovation, and creates employment opportunities for a diverse local workforce. SFMade is a 501 (c)(3) non-profit corporation.